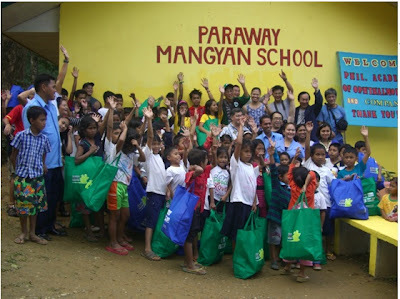 Incorporating ‘green’ into the advocacy, The Philippine Academy of Ophthalmology (PAO), granted the needs of Paraway Mangyan Elementary School in Puerto Galera, Oriental Mindoro by donating hundreds of unused bags from medical conferences that they attend every year in this year's EyeBags. EyeBags, a campaign that seeks to support the education of students from underprivileged families through the donation of various school materials, volunteers from the PAO and graduates from Xavier High School, Class of ’82 trooped to Oriental Mindoro to distribute the said medical conferences bags, containing school supplies, clothing items and some teaching materials that can be used by students and teachers a like in their every day school life. According to Dr. Johann Michael Reyes, PAO Committee Chair for Public Relations, they believe that education is one of the best ways to change society, and so with this project, they endeavor to help instill hope in the hearts of Filipino children, one Eye Bag at a time. The PAO is an internationally-recognized specialty society of ophthalmologists in the Philippines. It aims to ensure access to quality eye care for Filipinos. The PAO commits to continuously develop its members professionally through clinical education, research and practice management, in a collegiate and harmonious environment, contributing to ethical, professional and compassionate practice. “These convention bags are highly functional. 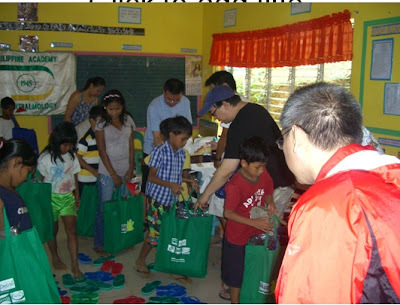 Instead of throwing these away, we thought of engaging all the eye doctors who are members of the PAO to donate the bags and reach out to Filipino school children in need of support. 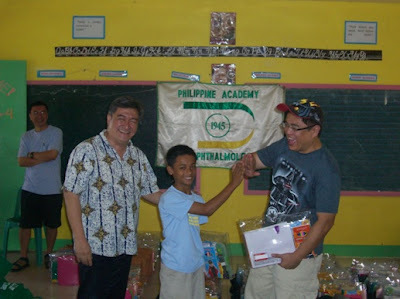 The project has grown tremendously that we have expanded to donating other school materials to help promote and enhance students’ learning experience in their schools,” added Dr. Reyes. The PAO accepts donations through its secretariat. Individuals and organizations may contact PAO at (02) 813-5318 or send their donations to Unit 815 Medical Plaza Makati Condominium, Amorsolo corner Dela Rosa Streets, Legaspi Village, Makati. For more information about the The Philippine Academy of Ophthalmology, you can visit www.pao.org.ph.